Another shorter version (the one that, after correction, was now on openrice) also got rejected on the same issues... It took email/forum post over the past week for openrice to come back and said they don't want the outside link. Those link are either to knockbox due to its undecided hours and the longer/original version on this page for the person who is more interested. A total waste of time. Openrice apologized and promised to improve but I think it's a bit late after trying to contact them over a week with no response at all via email and its own forum. The writeup below is actually the version that I believe is much more suitable on telling Knockbox story and why I'm so excited about this cafe. When was the last time cafe's visit is fun.. This is the type of café I wish I found at the time I started to be seriously interested in good coffee a long while back. Seriously good coffee (SCAA's member) & art!!! Knockbox Coffee Company is run by coffee enthusiasts who got inspired by drinking coffees prepared by Gwilym Davies in the UK until one day Mr. Davies disappeared from his shop and both were told Mr. Davies went to World Barista Championship in Atlanta, GA, USA. Of course, the rest is history; Mr. Davies was crowned World Barista Champion in April 2009 and Patrick, one of the proprietors, is currently on his way to become a Q-grader, a professional accreditation for coffee graders and cuppers, likely by the end of this year. In the meantime, they open Knockbox which, to me, is a proof of their genuine enthusiasm on coffee!!! Stairway to heavenly coffee or StairMaster? I blamed the location for the procrastination in me to go this place even at the urge/push of a coffee enthusiast I know and trust. At the time, I thought what’s the fuss about this place? 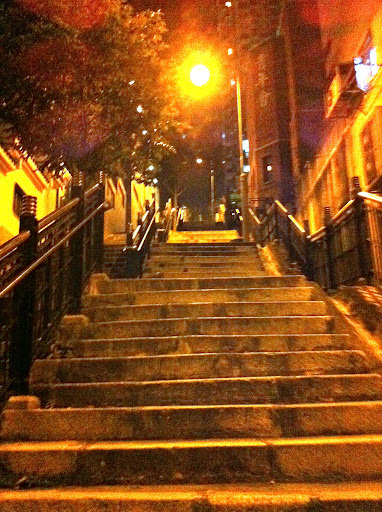 Also, walking up the Ladder Street in Sheung Wan is definitely not my favorite pastime. However, I now know why such a push from that enthusiast, particularly after I reached Knockbox. This is the place that really caters to coffee lovers. Unlike almost all cafés in Hong Kong that call for high turnover/more drink served as fast as possible in a limited time span, Knockbox is run more like a friend get together to talk coffee with one another when they have spared time. This is great for those who just started in coffee as one can talk freely and is more likely to find out what one likes, how each coffee/brewing methods contribute, etc and ended up long for the next time they all can meet again!!! And you are talking to proprietors themselves who definitely are coffee lovers (no, I was barred from using the words “coffeegeek” on them… ) that emphasize on the whole coffee experience vs. other cafes that may be too busy or burned out to do such things. Of course, any customer is more than welcomed there to just sit, relax and enjoy coffee by oneself. Kudo to Knockbox’s operators that make this happen as it’s so hard to find this kind of place with an lively interaction on coffee at most cafés in Hong Kong no matter how good they are. My 1st brush with Eva Solo. Nice menu too!!!! I like the menu a lot. Knockbox offers a regular coffee menu like any other café but two main things stick out, the Coffee Grand Slam (in short, a coffee tasting menu) and only single origin bean for its default espresso which changes on a weekly basis, depending what’s best available at the time. On top of that, various coffee apparatus are not to be missed. For example, this is my first brush with Eva Solo in a café setting, particularly with the red "jacket". I saw the black one at Great a long time ago and it's $$$. Apart from the high end $$$ KōNO siphon (not your typical Hario or any other lesser soul! ), the halogen lamp is of cutting edge for this type of brewing method with a good temperature stability in mind. I’m definitely not an expert in the siphon coffee and I suggest you let the cup show you how good it is. While all brewing methods are beautifully executed here, I like siphon here the most, clean, clear and easy to get all the tasting notes, a work of art on the type of gears selected and the barista himself!!! Knockbox roasts its beans in-house with the top of the line home roaster Gene Cafe. 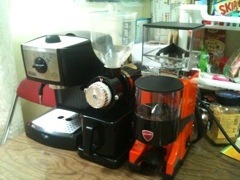 The espresso machine is pressure profile-modded Expobar. Pressure profile is definitely a current "IT" technology to deal with the current "hip" but hard to nail espresso coffee, the single origin espresso. Not many café in Hong Kong is willing to use single origin for its espresso, so does most café in the world due to its wilder nature than more common espresso blends of various bean origin. The Single Origin espresso is definitely the current trend in the progressive cafe and roaster and I highly suggested you try it once when you see one. While Knockbox opened its door only a month or so ago, Knockbox already has a plan to up the ante on their gears with a new dedicated grinder for filter coffee to achieve a much cleaner cup with a more consistency on grind size in mind. In real estate, it's location, location and location; in coffee, it's grinder, grinder and grinder!!! Also, a new roaster from Probat, a German legend and renowned commercial roaster until these days, will arrive at Knockbox over the period of a couple of months. This, to me, will really kick things up several notches above almost all cafés except the selected few at the top. From the menu, I highly recommend the coffee grand slam. In essence, it’s three cups of coffee any which way you like. With various combination, i.e. one coffee three brewing methods, three coffee on one brewing method, or any other combination to your heart desire, one could get up the learning curve real fast and can easily find out what one likes. The knock-on effect is more akin to the ability to roughly pick the wine by reading the tasting note on its label with a coaching/input from this Q-Grader-to-be at Knockbox, particularly when you are spoilt for choices of row and row of coffee bags from various origins/blends. Besides, it works very well for both new and old hands in coffee in introducing and refreshing one’s experience with seriously good coffee. My first coffee was brewed via Chemex, my first time with this brewing method. I was totally shock on how big the size of its paper filter (the top of the picture). After several folds, it fitted neatly on Chemex cone on the bottom left hand side... Very cool and classic, isn’t it? An in-house roasted Ethiopia Yirgacheffe in the cup had a winey tone that cannot be mistaken. Bitter dark chocolate was clear in my mouth, particularly when it further cooled down. Cooler coffee in the high 40 degree Celsius makes it much easier to detect the taste and the flaw in the cup, IMHO. Nevertheless, I like my coffee much lighter roast than this level though the good thing is that I didn’t get any ashy tone or anything bad, like dark roasted coffee I had outside even from local Indie’s roasters. My second cup was also the same coffee brewed by a steel cone filter Coava KONE version two. There were lots more sludge in this cup than Chemex but I ended up with much tastier coffee with clearer floral and tea like notes, a character of the steel filter that lets the aromatic coffee oil go through the filter into the cup vs. the paper filter that absorbs most of such nuances on to itself. Despite the lower brew temperature at 81 degree Celsius for KONE vs. 85 degree for Chemex, acidity is quite hard to detect, a character of quite a dark roast itself. Don’t get me wrong on this that Knockbox caters to a more traditional style drinker at the expense of beautiful, light roast and fruit forward style of progressive roasters these days that lead the renaissance of current coffee awareness. I myself was partly responsible for it as I asked for the freshest coffee they had on hand and this Yirgh was intended to be for its iced drip coffee preparation to be served on Saturday. But muddier (L). Expected new grinder will help! Actually, Knockbox carries various styles of coffee at any certain period of time, unlike most café that only has one particular coffee in stock. Apart from a variety of coffees from local and international roasters they have on hand such as 89-point coffeereview.com coffee from Taiwan's Caffe Artigiano, a roaster I couldn't remember the name from Australia and, in the past, Square Mile Coffee and Hasbean from the UK, Knockbox’s also uses green beans sourced from both local and renowned green bean sellers in the US ranging from generic to award winning Cup of Excellence (CoE) grade. There’s always a good surprise in store on the coffee anytime you drop by at Knockbox unlike the same old same old of most café in Hong Kong and every week offerings will be different, depending on what proprietors think best at the time. How cool is that!!! I purposely asked for no latte art on my milk drink on that day but the latte art on my drink should be considered quite nice vs. my request. In fact, off the topic a bit, I think the latte art is kind of carried away in the world of coffee these days. At the beginning, it showed care that goes into cup and aroused interest to those new to the coffee world. However, people ways overdo it with designs and things which, to me, are a distraction from the essence of good coffee, the cup that we should enjoy ‘drinking’. I’m against overdone ‘arts’ and prefer my milk drink free pour with no spoon during the pour. For the "spoon fanatics" in frothed milk pouring out there, I strongly felt the spoon destroys the velvet texture of the frothed milk you guy have been trying in vain to make things happen!!! So, no latte art; just the nicely frothed milk to a velvety texture and the warm temperature is what I am looking for in my milk drink and that’s where the charm lies, not on the surface!!! Of course, the milk drink I had from Knockbox had absolutely no spoon involved in the milk pouring process and it showed up very well in the cup as one of the best milk drink I have ever had on texture which is very thick, rich and velvety, rivaling the good milk drinks Crema spoiled me most of the time and I prefer this to the Aussie style lighter/more fragile foam/body/somewhat sweeter style you can have it from almost any decent café in Hong Kong. Only if it is sweeter but this is the same crime committed by Crema... You can't win them all. To me, Knockbox is a perfect complement to any other café out there, particularly the busy and renowned ones in the industry. Proprietors take time to talk to its customers on every level of interest, are very patient in listening and answer questions to customers with gusto. Once ‘refreshed’ from Knockbox, customers can go back to their favorite cafe and more likely to see thing in a new light at their regular haunt... How cool is that matching Knockbox's business model with existing cafes. Not competition but mutual benefit!!! The no rush/friendly/coffee talk is not to be missed and I can only hope Hong Kong has more of this kind of place. Highly recommended!!! Knockbox's hour is still somewhat restricted; the hour is, for now, Friday night and late morning and afternoon on weekend. However, this works great for me!!! Sounds like a really good nice for coffee nerds. Will check it out soonish! @iamnth: Not just for nerds for sure but for anybody. Don't be too surprise if you feel so comfortable asking questions and questions as proprietors are one of the best and fellow coffee enthusiasts like you and me. tried kenya xxxxxx coe, hand drip, you can taste 5 layers and each connection very clear. 5 layers. Wow, I don't think I'm capable of detecting that but sounds good. Is this the one I had before there I was told new profile for City? Tegu is a coffee washing station, a wet mill, a coffee factory. Well, it's all three. A "factory" is a wet mill where the coop members bring coffee cherry for pulping, fermenting, washing, drying. It's not the factory as we might imagine it. Small washing stations are aligned with a particular "society" which is what they call a cooperative in Kenya. Tegu is part of Tekangu Farmers Cooperative Society (FCS), which combines the names for their 3 factories: Tegu, Karagoto and Ngunguru. I visited them several times, since we have bought many small lots over time from Tekangu. While most of the lots this year grade out as the smaller AB preparation, this is unrelated to cup quality, which can be better in AB grade than AA in some cases. The quality control at the Tegu mill is impressive. What I saw was excellent sorting of cherry at the mill by each picker, before they submit the coffee to be processed. Over-ripe and immature cherries are culled out. They also have a system where pickers are graded as A or B. "A" pickers are those who have been proven to deliver well-selected and sorted cherry, and they are invited to submit coffee on the "A" day, when a higher price is paid. "B" pickers are still yet-to-be-proven, or have had more immature beans and over-matures in their bags. They must come on the lowly "B" day and are paid less. Maybe it seems harsh, but there is no better way I have seen to create an incentive for quality harvesting, rather than mindless strip-picking of the coffee tree. (By the way, this A and B picker system has nothing to do with the AA or AB grade, that refers to screen size of the coffee at the dry mill only. AA, AB and PB all comes from the exact same lot submitted to the dry mill, and is separated only by the coffee size screening equipment). This review is for the second arrival of Tegu from the current crop, which was shipped in vacuum packs. The dry fragrance is malty, with an almond essence. The darker roasts have increasingly potent brown sugar note on the grounds. The wet aroma has hop flower in the light roast, but wine-like black currant in darker roasts and on the break. At FC the break is caramel with just a hint of rindy sharpness hiding in the back. The cup is a complex fruited character: currant, melon, ripe cherries with a hard-candy sweetness in the finish. I really can't state enough what even one more extra day of rest does for this coffee, the winey and jammy acidity is fully integrated into the syrupy body and there's more complexity to the sweetness, with caramel and vanilla present at FC. Dark berry notes that weren't present at 12 hours of rest really emerged at 24 hours rest, and were even more intense at 48 hours. At the right roast, the mouthfeel has this interesting "fatty" confectionery quality, but this could be an effect of the flavors. C+ is where I got this coffee to sing for me, the body is nice and the melon is intense with a muscovado sugar... so sweet. This is not the most citric or acidic Kenya, and some will find it less compelling as such. I think the balance, body and depth are welcome qualities. 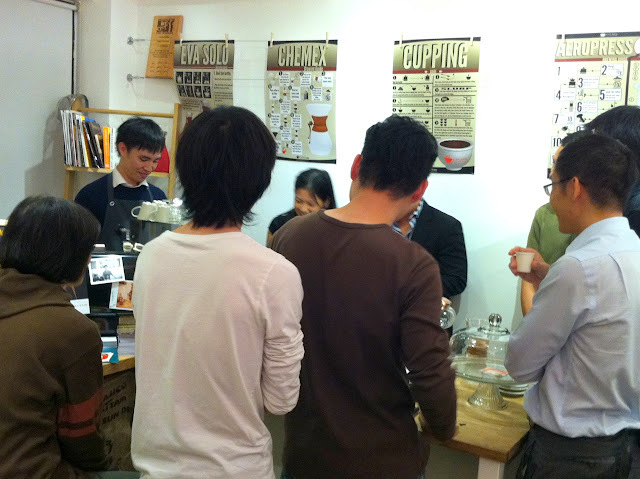 發表於: 星期五 十一月 11, 2011 12:18 am 文章主題: The Brewers Jackpot @ Knockbox Coffee Company!!! The Brewers Jackpot @ Knockbox Coffee Company!!! Jonathan, a new barista at Knockbox Coffee and a Q-Grader candidate, is doing the drip. After all the water went down, a nice cone shape of ground left in the funnel. This cup matches almost all cafe in HK and showcase nicely the $$$ green bean from Sweet Marias roasted by Knockbox Coffee's Patrick. Espresso Uganda - a bit salty to me but with a nice creamy note... Interesting coffee and maybe better with a new shot. Look really messy here but this was where all the fun begins... Lots of interests, lots of passion. As I said somewhere before, when is the last time your cafe's visit is this fun. And last, but definitely not least, the coffee used in the competition tonight! THIS COFFEE IS A MIX OF TYPICA AND "GESHA"
THIS IS THE COFFEE WE USED FOR SHOOT OUT TODAY>>> PATRICK, YOU REALLY SPOIL US!!! Wet aroma: I smell money in the cup!!! In the cup, it just confirmed the wet aroma but with some bitterness from the very first brew. Some of the coffee were beautiful/delicious, particularly via Mike Fung and Jonathan Fan. This is definitely not my cup of coffee though it's really good. Nope, I'm not qualified to do any drip and I can assure you I will be the last one in this test if I did it. Try Knockbox! Highly recommended... It makes other cafe felt 'ancient'!!! 發表於: 星期五 十一月 11, 2011 8:23 am 文章主題: Re: The Brewers Jackpot @ Knockbox Coffee Company!!! That's scoring system is actually goes the other way around Bob. The lower u score the less "watery" in the coffee =more taste to the cup. The higher the score the more see through the water = less taste. So I didnt let you know mate haha. 發表於: 星期日 十一月 13, 2011 7:05 pm 文章主題: Re: The Brewers Jackpot @ Knockbox Coffee Company!!! Great!, I am luck to try your before left. Looking forward to the next event. 發表於: 星期一 十一月 14, 2011 10:43 am 文章主題: Re: The Brewers Jackpot @ Knockbox Coffee Company!!! thanks bob for your wonderful review. and thanks everyone for attending the semi-scientific brewing jackpot competition. it will not be long before we host another similar brewing session. 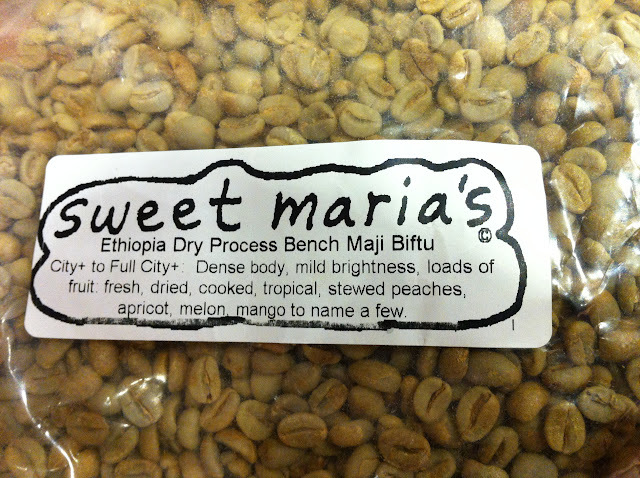 I have ordered the same bench maji biftu from 2011 taiwanese roasting champion! let's try his roast and see what flavours he can bring out (and be critical to my roasting)! Anyone can share the videos for their pouring methods? I doubt anybody taped it. Just go to the shop and look at them or wait for next activity likely to be announced via Knockbox facebook or twitter..
Wow... It is so interesting to have such brewing competition. But is it really welcome to public? It seems to be a private party. Anyway, I will visit it and wanna try the coffee grand slam! The best time to visit is Fri night. Sat afternoon is the most crowded and they might not have time to talk to you. 15 minute waiting time for a cup of coffee is normal for Sat afternoon but lots are willing to wait!! !